Leave it to JL to jolt me from my doldrums. In his latest menagerie, the self-admitted timelord leads a vantastic voyage of cosmic scale and deadlines lost, one in which his tiny broadcast talisman lurches for purchase on a peyote-strewn surface before slipping into another dimension. Another Dimension? 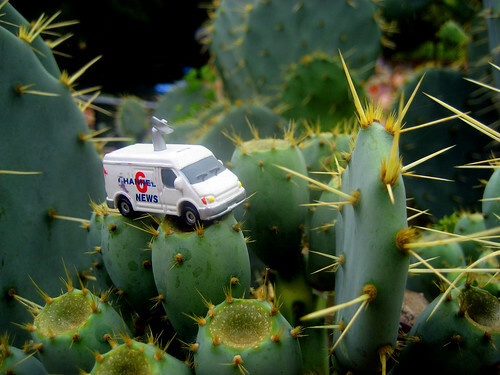 Dwarfed by a world that defies team smotherage, the plucky news truck misses live shots and deadlines before achieving what can only be described as the prickliest of vistas. By juxtaposing the risk and reward of such otherworldly remotes, the artist otherwise known as Little Lost Robot illustrates the inner struggle of electronic interlopers everywhere. That, or dude's just takin' pictures of his toys again. I can never decide. A woman just pointed at my tripod (no camera attached) and said "It's not on, is it?" I nearly sprayed my laptop in Old Grand-Dad when I read this, for I've never even looked to see if my tripod had an On/Off switch. 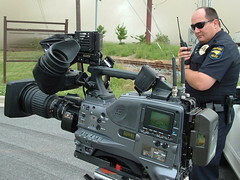 Then again, passersby have been making strange requests about TV gear since the first photog threw his back out. These days of course, even your toaster comes with its own tiny lens but the proliferation of videocameras in everyday objects has yet to dawn on the looky-loo. Diminutive lenses in the hands of amateurs will change that, but for now those magic boxes that distill reality continues to confuse and frighten your average caveman. Just ask any news shooter who's stood with a garishly-logo'd fancycam bristling on his shoulder, only to have the person he just removed a shiny lapel microphone from ask when this would 'be in the paper'. That gets me every time. Then there's the Ugly Duck. You know, that little move people make when they walk by a fully erect tripod with fancycam on top. Most folk bend at the waist and scuttle on by like Mr. Miyagi stuck on perma-bow. Others kind of crab-walk, or drop to the floor in a back-breaking limbo move that would impress even that dude in the tight shorts at the Roller Rink. Hell, I've seen old ladies crumple to the floor like a late 80's break-dancer to avoid whatever death ray she think my lens emits. Hmm? 'Are we LIVE?' Let's see, I'm straddling a canoe in the middle of Lake Upchuck. You've got a bent fishing pole and I have a single camera on my shoulder. "Yes, yes we ARE live. In fact I'm beaming this straight to the jackhole in Hollywood who green-lit that stupid prison scene in Up Close and Personal. That one film did more to damage camera credibility than a thousand 'Blair Witch Projects'". A-hem. Anyway, I'm projecting and since I haven't so much as picked up a fancycam in two whole days, I have no business displaying that kind of angst. In fact I should be happy when people cower in fear at the sight of my gear, for once eyeglasses come with their very own hard-drives, my silly equipment will lose much of its mystique. Still, it's hard to not to flinch when someone overreacts to the presence of a news crew. Take... that guy... the one low crawling past my camera on his fingertips. I understand you're being polite, Sir, but if I didn't want people walking in and out of frame would I really be hunched over my viewfinder on the floor of the Food Court?